Thinking of taking a trip to the dog beach? Fox Valley Animal Hospital of Wahroonga has you covered. Summer holidays for many means taking your dog to the beach. Whether you are venturing to the Northern Beaches of Sydney, taking a day trip to the Central Coast or going either further afield, it’s important you do it safely. At Fox Valley Animal Hospital, we love taking our dogs to the beach for fun and play. Here’s are a few things you may need to consider before you head out. A fun day at the beach means having the right plan for a fun day out. When it comes to dogs on beaches, this means what you pack and where you go. Always observe the regulations set down for each beach you plan to visit. The off-leash areas are usually listed on local council websites for your pre-planning purposes. Also make sure you observe the signage to ensure you are using the right area of the beach for dog exercise and play. Some beaches will have a designated part of the beach area rather than the entire beach. Observe the signs and regulations at the off-leash beaches. It minimises tensions between locals and visitors as well as various kinds of beach goers. If in doubt, ask other dog beach goers before venturing forth. Beach days are hot days. Just like you would pack extra water, snacks and appropriate sun gear, your dog too needs water, treats and appropriate shade. You will also need poo bags and a towel to dry your dog post swim. If you dog is the type to want to play fetch, resist the urge to use sticks and other items found at the dog beach. Come prepared with appropriate dog toys instead. Sticks can cut gums, break teeth and even become lodged in the throat or stomach if they are chewed. Beach dog toys are built for your dog’s tough mouth but without placing it at risk. It also helps to use water specific toys for games of fetch. Dog toys with flotation devices can be easier to spot and retrieve. The humble tennis ball also has had a significant upgrade to the hardy Kong versions of the popular ball. These make play risk-free and enjoyable for all. Finally, prepare for clean up. Bring dog poo bags rather than relying on the dog beach to have a supply. Make sure you pick up the dog poo rather than bury it. It’s much nicer for other beach goers as well as better environmentally for the coastline and ocean. As tough as your dog’s paws may be, hot sand and hot pavement can still inflict damage on paws. The pads your dogs have are sensitive to heat and can sustain injury from burns. They can also cause your dog to bolt to get away from hot surfaces, making them harder to lead. They may not come when called if they perceive the ground near you is too hot. The best way to check if sand or pavement at the beach is suitable for your dog is to use the back of your hand to test the surface. If it’s too hot for you to touch with the back of your hand, it will be too hot for your dog’s paw to withstand. Paw burns from hot surfaces can cause painful blisters and take a while to heal. Considering your dog needs their paws to move, it is not worth the risk on scorching hot days. Loads of dogs love catching waves, fetching the ball and swimming in the ocean. This is perfectly fine and safe for your dog to do. Where it becomes difficult is when you dog chooses to drink the sea water. Salt water is toxic to dogs. Ingesting it can make their stomach upset and bring on the fateful beach diarrhoea. It is quite common for new puppies to try to drink sea water. This is why it’s imperative to supply a safe, fresh water alternative. And keep an eye on them! Carrying a water bottle for your dog can teach them positive habits. It’s a must for any dog beach day trip or trip in a car, especially in summer. Where is becomes even more problematic is if your dog continues to directly or indirectly swallow sea water. Directly may be if they choose to drink it. Yet many dogs can also swallow a lot of salt water by fetching and playing. This indirect salt water swallowing can be just as worrying as dogs that actively seek it out. If your dog drinks large quantities of sea water, it can poison them. This level of toxic salt in the bloodstream can cause continual vomiting and diarrhoea. It can also lead to dehydration, loss of coordination and seizures. This needs immediate veterinary assistance. Bluebottles, jellyfish and other sea creatures have a varying degree of impact on dogs. Some can eat sea creatures and be fine, others can end up with an allergic reaction and need a trip to the vet. Some can handle the stings, others will become quite sick from it. What you don’t want is your dog to come into contact with them if you can help it. And if you see that your dog has been stung or eaten a creature at the beach, don’t wait and see. It’s much smarter to seek treatment and advice early. By doing so, it means you won’t prolong any sickness or injury. And it also means that you can begin treatment as soon as possible. It’s always harder to fight off a strong reaction than it is to treat a pet ailment or injury in the early stages. Give your vet and pet a better chance of a full recovery by acting sooner rather than later. Those lovely dog paws that run down the beach, along the shoreline and up the rocks are not invincible. If they can be damaged by hot concrete or blistered by hot sand, they can also injured by other items at the beach. Cuts on shell grit and oysters are not uncommon. They can be long and shallow or deep and small. Or a combination of it all. The issue with dogs is they don’t often notice they have caused themselves an injury. We’ve heard of cases where happy-go-lucky Labradors have run up and down the dog beach without a care in the world. Their worried owners have hastily trailed behind seeing blood pool in paw prints from a cut with an oyster shell. This sensitive area of the body needs treatment if damaged. Sometimes, it might be a case of cream to aid with the healing and a clean up to ensure no small pieces remain lodged. Other times, it might be stitches and antibiotics territory. How to avoid this from happening is to try and choose beaches where oyster shells are not found in the shoreline and on rocks. 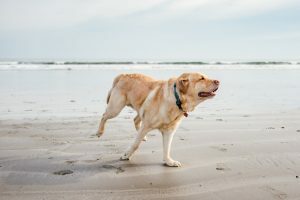 It may also be useful to use a long leash as opposed to allow free reign at the off-leash dog beach to make sure your dog doesn’t venture too far. We all know dogs can be at greater risk of shark attack. This must be a consideration when you are choosing to visit a dog beach. Only choose designated off-leash areas and never risk beaches you are unsure about. You also have to be careful of rips and other wave formations. Even the biggest, most confident dog will find a rip difficult to move out of. Waves can also dump your dog and with it, that confidence. Choose the surfing conditions for your dog the same way you would for yourself. Don’t choose a rip, avoid rough seas and pay attention to the notices about the surf before entering. Too many dogs die in preventable tragedies in part due to owners assuming watering holes are safe when they are not. Don’t let your dog be one of them. Want to be prepared for your summer holiday dog beach trips? Why not pop in with your dog to have a checkup and check out our range of water safe dog toys. You can even discuss the kind of holiday you are having and seek advice on keeping your dog safe.